Archbishop noted that the survey revealed issues that affect every Catholic Australian and are all issues which the Church cares deeply about and has much to say about. But Archbishop Fisher also stated that amongst these issues is great cause for hope, as these issues highlight the need to redirect ourselves towards the message and life of Christ. 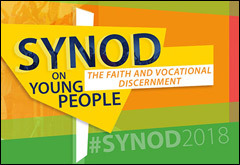 Trudy Dantis, director of the Pastoral Research Office, which conducted the survey, said that the overwhelming response shows that young people value what the Church is doing for them, yet at the same time feeling confident to express their concerns with the Catholic Church. Trudy says that the Church will use the information gathered from the survey to help better understand the Catholic youth of today and to better inform the Church’s ongoing ministry towards young people.